Two years ago, I published an article on Symantec’s iamtech Medium publication that shared my unique experience advocating for LGBTQ rights in India, and championing this cause across our Symantec Pune and Chennai offices. While underneath the surface a conversation was brewing, at this time in India there was little public discussion on LGBTQ equality in the workplace. In a very personal story I shared what it meant to have the support and acceptance of a company like Symantec when the law did not protect those of us within the LGBTQ community. Today, two years later, I am happy to share my personal perspectives again – but this time to share a changing environment. Public discussions are more common and more companies – such as Symantec – are advocating internally for LGBTQ equality in the workplace through policies, programs, and roundtables on the topic. Symantec still remains one of the few companies in India that is vocal both internally and externally about its culture of inclusion. 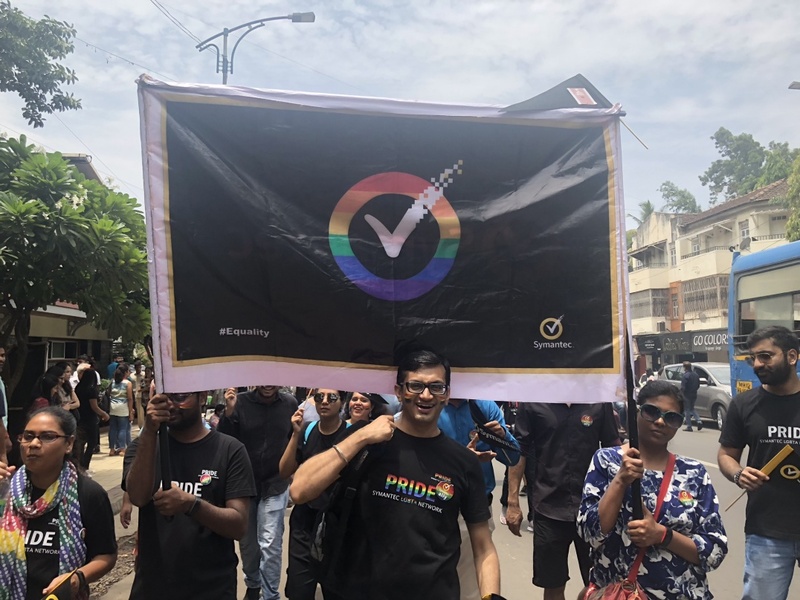 For example, Symantec has been participating in the Pune Pride Parade for the past three years, making the company’s commitment to LGBTQ employees publicly visible. This also sends the message to our LGBTQ identified employees that we take LGBTQ inclusion seriously and to those outside, that Symantec is a safe place for them to work. This year, having the participation of nearly two times the number of people, including a senior leader Sudhansu Pandit, India HR VP, walk the Pune pride with us sent an even stronger message to the employees in Symantec. This wouldn’t be possible if the Pune LGBTI Pride organizers hadn’t invited and let us participate visibly to show our commitment to our employees. "Pune Pride Walk, the very mention of it triggers a flood of memories. In 2017, when I was asked to lead the Symantec contingent in Pune Pride Walk, I had a zillion butterflies in my stomach. Being quite new to Pune and having never walked in any Pride Marches before, I was quite apprehensive. And then… five faces I had never seen before, turned up. Quick introductions were made and together, the six of us, walked hand-in-hand waving the huge Symantec Banner! We felt proud and thrilled to march for "Love & Equality for All"! That walk was the beginning of quite a few beautiful friendships for me that I cherish and hold close to my heart. I am so happy to see this progress, but I truly believe much more needs to be done. From employee awareness programs to issues faced by LGBTQ employees to inclusive benefits in the workplace, there is so much opportunity to advance LGBTQ inclusion in the workplace in India. Additionally, the workplace is still fairly male dominated and this influences all cultural areas including diversity and inclusion. Lastly, there is still a tremendous lack of diversity within the “visible” LGBTQ community, tending to be those with social privilege and capital. As the discussion progresses, there is a real risk of the LGBTQ community in India being limited to a certain demography. This is where I believe LGBTQ champions and diversity professionals must work more closely along with each other and with other groups to understand intersectional issues. I believe we need to get beyond just ‘fixing’ the lack of diversity in the LGBTQ community, to looking at where it stems from – our hiring and workplace culture – and how we can change this over time so a lack of diversity is no longer the norm. My hope for our world – and my advice to everyone – remains the same as it was two years ago. You have to push even harder in an organization where the culture makes you feel like no one is listening. Don’t give up. Together, we continue to make one cubicle, one company, one city, one country feel welcoming and safe at a time.